Showing results for tags 'Mashaaf'. I years of thinking about it, I bought an airbrush system last week. 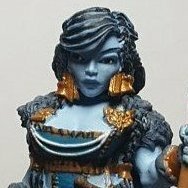 I've never airbrushed before and everything I've seen says to take it slow and plastic before using it on a model, but I'm too impatient for that. I started with the Bones Rats. Then moved to the Bones Deep Ones Then experimented with shading using the Bones Spawn of Shugniggurath. Then went big with the Bones Mashaaf. Its actually harder to learn than I expected. Luckily I have lots of Bones to practice on. Ok this took me a very long time to do. I hope you enjoy but some background first. Mashaaf is one of my favorite miniatures from bones 2 and I was eager to paint her up. I couldn't settle on a color for the skin and nothing looked right. I ended up repainting her 4 times and figured I'd go down with the ship this time and this is how she turned out. Not to bad if I do say so myself. I did some reorganizing of my painting desk over the weekend and thus finally pulled out the lightbox that my friend gave me for my birthday back in August. So I took a few pictures of Mashaaf (ok, a lot of pictures ) so I thought I should do a show off thread for her. Here is her WIP thread: http://forum.reapermini.com/index.php?/topic/71909-guindyloo-vs-mashaaf-in-5-days/where I painted her in 5 days with a size 0 brush for OneBoot's Purple Cat Challenge. Thank you for scrolling through all of my many, many pictures. There's a few things I would've done differently had I not run out of time, so all comments and criticism are very welcome! I have some time off of work with the impending holiday so as always, it's a perfect opportunity to chuck my marbles out the window and take on a paint slopping challenge! If you're not familiar with the Purple Cat Challenge, I highly recommend that you head over here: http://forum.reapermini.com/index.php?/topic/71342-introducing-the-purple-cat-challenge-mashaaf-in-5-days-wip/page-1 where you can see OneBoot establishing the challenge and defeating Mashaaf herself! 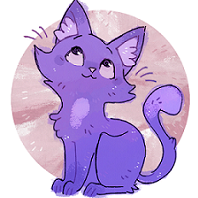 Who wouldn't want to take on a challenge set forth by a purple kitty? So here are the roolz: 1) Thou shalt not use any brush larger than a standard size 0. 0 shall be the number on the brush, and the number on the brush shall be 0. 1 shalt thou not use, neither use thou 2, excepting that thou ensures that it is actually 0/2 on the brush. 5 is right out. Once the size 0, being the correct number, be reached, then lobbest thy size 0 brush towards thy foe, who being made of Bones, shall be painted. 2) 5 full days (120 consecutive hours) from when the timer starts are all the time that is allowed in this challenge; whether that time is spent working, sleeping, painting or sobbing uncontrollably is up to the participant. 3) Boiling and scrubbing the model to remove casting residue are the only prep tasks allowed prior to the timer being started. Removing mold lines, greenstuffing or otherwise altering the original sculpt in any way beyond factory spec is prohibited. 4) The timer starts with the posting of a picture of Mashaaf and my intended brush(es) to be used and a device bearing my local time. The challenge will therefore end at the same time 5 days (120 consecutive hours) later or whenever I complete the task prior to time running out. You guys know how I roll. I'm not even slightly prepared for this (or am I? ) as my life is a slow crawl of constant disasters. My desk is as much of a wreck as my brain. I did, however, actually take Mashaaf out of her little baggie and dry-fit her though! But she needs some serious boiling if she's ever going to stand upright. And I'm still at work and will be for several hours. So my best guess is that I'll probably be officially starting on her tonight somewhere around 7 or 8pm CST! I painted this up a few months ago. I've still been meaning to flatten out the base and paint it but here is everything so far. I had a lot of fun with this one. I was doing home remodeling and was self-exiled from my home and paint desk for over two months, so when I got access to my hobby room and paint desk and reorganized, I collected all my unfinished projects on the desk and realized my shelf of shame had grown to unacceptable proportions. I decided to tackle finishing as many of these pieces just to get them off my desk before I move on, even if I speed paint them or cut steps, but I am tired of looking at too many primed-only or part painted minis. So here is the first wave: Mashaaf which was my favorite to paint among these, the bones mummy lich I had nearly finished six months ago, which was nice except had too soft details on the face, the Scibor elven ruins, Mega Miniatures pack mules I base coated two years ago, and some GriffinTamer terrain pieces. These are not my best work by far but I'm going to call them done for now to get them off my desk and maybe some day I will go back and add some more finishing touches. I finally finished painting old maggot-breath, Bones 77375: Mashaaf. It's a big figure, which made it a bit tricky to handle while painting. In the first photo, I've included a figure of your friendly neighbourhood psycho-killer and vivisectionist for scale. Just in case you haven't already seen it, I kept a work-in-progress blog here. I've made a start on Mashaaf, a gigantic maggot-like abomination that came with the Bones II Kickstarter. It's a big lump of plastic, roughly 90 x 100 x 150 mm, and quite difficult to handle; I'm not really looking forward to trying to paint it. I can only imagine how difficult it would be to manage something like this in pewter. It needs quite a bit of filling between the sections, but no more than would normally be expected with a miniature of this size. I haven't (yet) filled around its arm-sockets; that may not be necessary (I hope). It's supposed to have a sort of panel-mandible on either side of its maw, but I was sent two of the same side and so one of them doesn't fit the moulded socket. I've filled both sockets, and I'll decide later on whether or not I want to try to mount the panels with pins. I may just leave them off entirely. Also, there are a couple of smaller sockets moulded at the sides of the tentacly mouth section; I have no idea what they're supposed to be for and I certainly didn't get anything in the package that could go there. I've filled those sockets as well. Bones II "Mashaaf the Devourer of Worlds"
77375: Mashaaf Question: identical arms? I am pleased as punch to have received my Bones II kickstarter. I do have one quick question for anyone out there. Does Mashaaf have a right arm and a left arm, or are both identical? If the former, then I may have gotten two left arms. I remember that a few of the models from Bones I had the same problem- so it might be worth checking a few before they go out. Thanks!